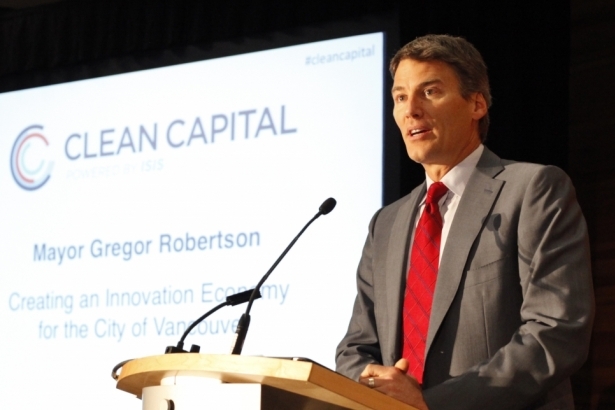 Mayor Gregor Robertson said the city’s clean technology companies are not getting nearly the same investment, media attention or policy support, that the country’s oil and gas industry is commanding. “Cleantech does not get the respect and recognition that it deserves,” said Robertson, speaking to the Partnerships for Canada’s Clean Economy 2014 conference Thursday. He added, while fossil fuel industries get half a trillion in subsidies worldwide, cleantech is a much smarter direction for all levels of government to support. “Given the staggering impacts and costs of climate change, the absolute necessity of taking action on it, cleantech has the most compelling reason of any industry in Canada for why it should be the focus of our economic development,” added the Mayor. Robertson, who has been vocal about the “unacceptable risk” of increased oil tanker traffic from a proposed Kinder Morgan pipeline, says Vancouver needs more “clean tech champions." Taking stage to show off their green business ideas were cleantech innovators General Fusion, Axine Water and Nest Labs, among many others. The CEO of Vancouver's Pulse Energy also said its firm of 55 employees had recently outfitted their “one millionth” commercial building with smarter energy-reduction software systems. California’s Nest Labs – which announced it will be bought by Google for $3.2 billion -- showed off its funky iPhone-controlling home thermostat that lets owners save money on heating and cooling. Director Andy Barnes said enough of the energy-saving thermostats have been sold to remove four heavy-polluting power plants. Surrey City Councillor Bruce Hayne also boasted about his city’s new Organic Biofuel Facility. When built in 2015, it will be “North America’s first closed loop system.” Natural gas trucks will pick up compost -- the compost will be made into fuel --- and the fuel will power the trucks. Robertson says rather than boosting fossil fuels – governments should be working with industry to reduce them and the emissions they create. 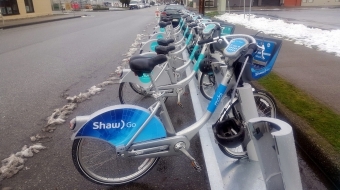 “We’re going to see the largest emitter sources of greenhouse gases in the city dealt with, and fuel switched over to clean, renewable energy,” said Robertson. This initiative will start with the Cambie hospital district, and soon provide central heat downtown. Vancouver is seeking to double the number of “green jobs” in the city by 2020, and grow the city's global brand as a "mecca" for green enterprise. The economic summit was put on by "Clean Capital" - a media initiative dedicated to increasing the profile of the cleantech sector in Canada.